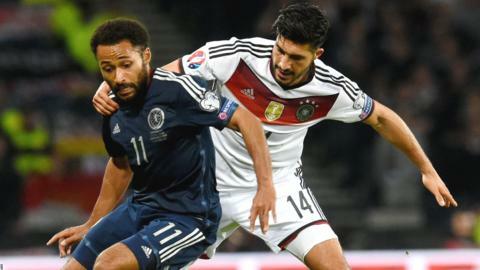 Ikechi Anya says performances in the Euro 2016 campaign mean expectations are now higher as Scotland prepare for the 2018 World Cup qualifiers. Anya believes Scotland came out of the Euro qualifiers with credit, though finished fourth behind Germany, Poland and the Republic of Ireland in Group D.
"I think you have to be positive about anything you do," said the 28-year-old. "We have got a good average age for the group, we've got our experience and we've got our youth." Scotland will face England, Slovakia, Slovenia, Lithuania and Malta in Group F qualifying for the World Cup finals in Russia. They kick off their campaign with a match away to Malta on 4 September. "I think it is vitally important that we go in there and believe that we can qualify," said the Watford winger. "Before this recent campaign I don't really think people believed in us as much as we believed in ourselves. "We came out of it with a bit of credit for the previous campaign and generally the thought is we can qualify for 2018." Scotland are in friendly action this week, first away to Czech Republic on Thursday before a home game against Denmark at Hampden on Tuesday.